When you are invited to celebrate Friendsgiving by a blogger whose work is a constant inspiration, there is only one reply: a resounding yes. After all, one of the greatest benefits of having started Lemons and Anchovies is the amount of friends I have made who share my love for food. Liren of Kitchen Confidante was the first connection I made almost two years ago. I dare you not to be drawn by her beautiful food photos and engaging writing style–I was, and I am now very happy to call her a friend. Liren has been celebrating Friendsgiving all week by inviting some friends to share their favorite Thanksgiving memories. 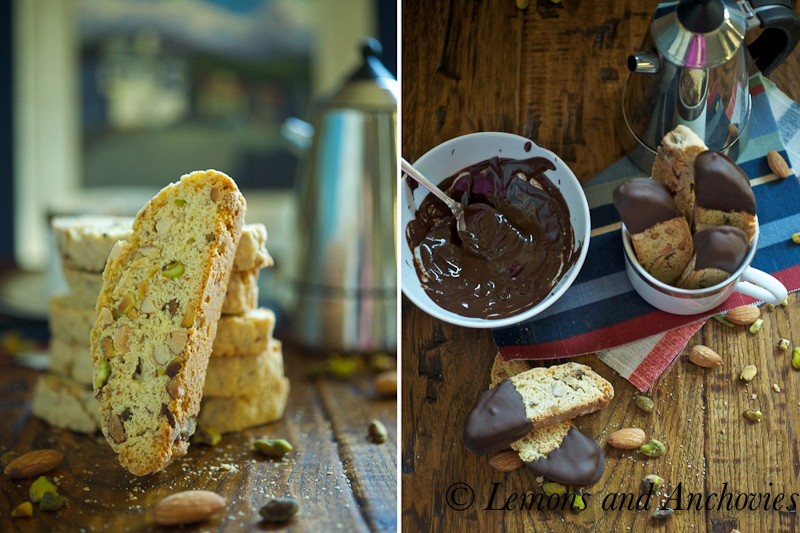 I share some of mine on her blog with these Chocolate-Dipped Pistachio-Almond Biscotti inspired by Francois Payard. Please stop by Kitchen Confidante for a look at my Friendsgiving guest post and the recipe for these very easy-to-make biscotti. Preheat the oven to 350 degrees. Line a baking sheet with parchment or waxed paper. Add the flour, baking powder, salt and lemon zest and beat just until combined. Add the eggs 1 at a time, beating well after each addition. Add the nuts and mix until combined. Transfer the dough to a lightly floured work surface and shape it into a 12-inch-long log. Transfer the log to the prepared baking sheet and bake for 20-25 minutes or until the log is firm. Take it out of the oven and let it rest for 10 minutes before slicing it. If it's not firm enough, put it back in the oven and back in 2-minute intervals. Leave the oven on while it rests. Using a sharp serrated knife, cut the log on the diagonal into ½ -inch-thick slices. 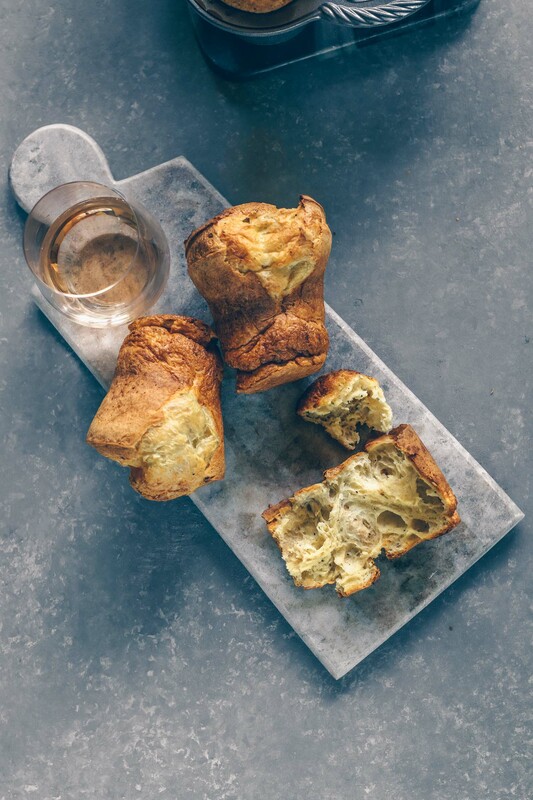 Place the biscotti cut side up on the lined baking sheet and bake for an additional 12 to 15 minutes, or until golden brown and crisp. Cool completely on a wire rack. Melt the chocolate in the microwave, stirring between 20-30 second intervals until almost all of the chocolate has melted. Stir until smooth and allow to cool for a few minutes before dipping the biscotti. Dip one end of each biscotti and lay on a sheet of waxed paper until the chocolate has hardened once again. Store the biscotti in an airtight container in a cool dry place for up to 2 weeks. Makes about 2o biscotti. Thanks for sharing the recipe!I love Friendsgiving, thats so cute! Oh how delicious! I am bookmarking this for the holidays, definitely something I’d like to bake! 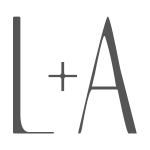 What a great guest post – and a wonderful idea by Liren to do a “Friendsgiving” series! I love biscotti this time of the year! Yours look so beautiful Jean! Great post and the pictures. Biscotti is my favorite snack. Just visited and as always….perfection. 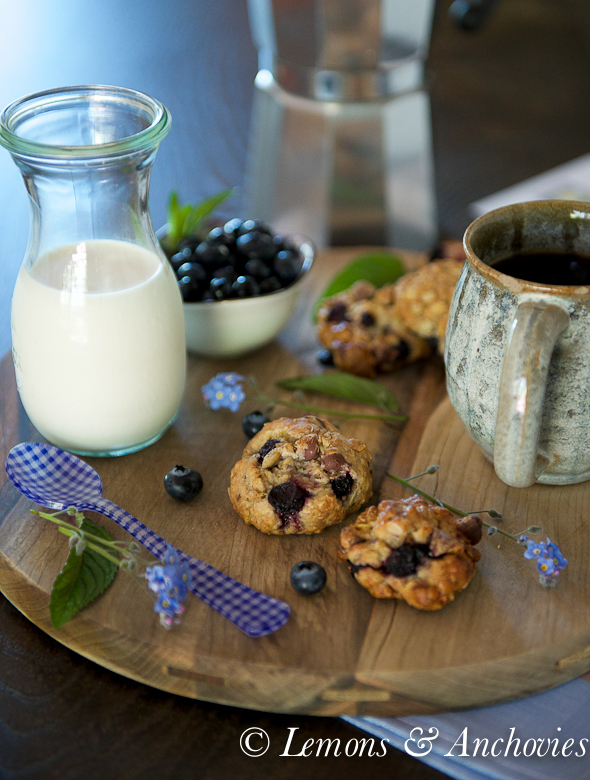 Your biscotti looks delicious, as always, and your words make me smile, yet again. I hope you have a blessed week and a wonderful season of joy and food and fun. Here I am as promised and now i am a follower. Had to correct my address…sorry! Jean, I can’t thank you enough for such a lovely guest post and even more for your sweet words here! Know that the feeling is mutual 🙂 I am so blessed to know you and hope you and the hubs enjoyed your Thanksgiving feast(s). Those sure look tempting! Would love few right now:)) Will check out your guest post! Oh I am loving this! 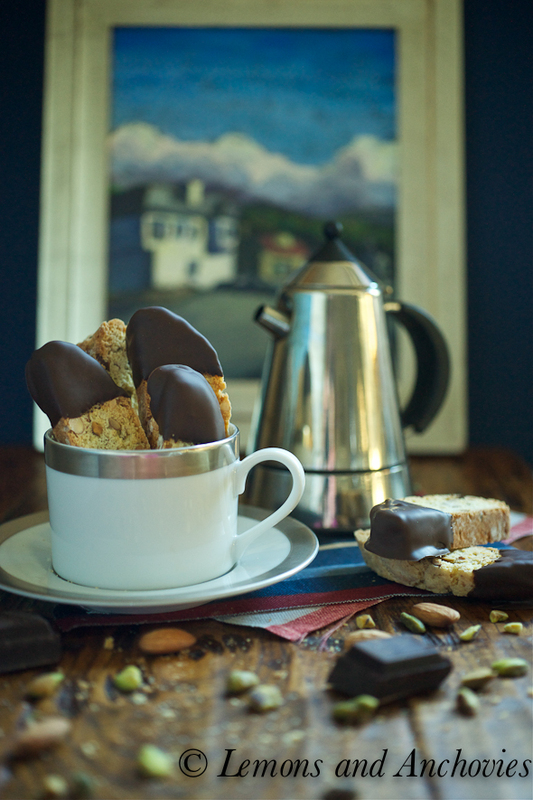 Biscotti are so good and I love the addition of the chocolate! I came over to say your pictures are gorgeous. They did what they need to, made me want the food. I’ll dream about these cookies and I”m not a sweets eater very much. These have that just right quality and must be served with coffee. But I would bite off the chocolate and then do a dip. Perfect biscotti! 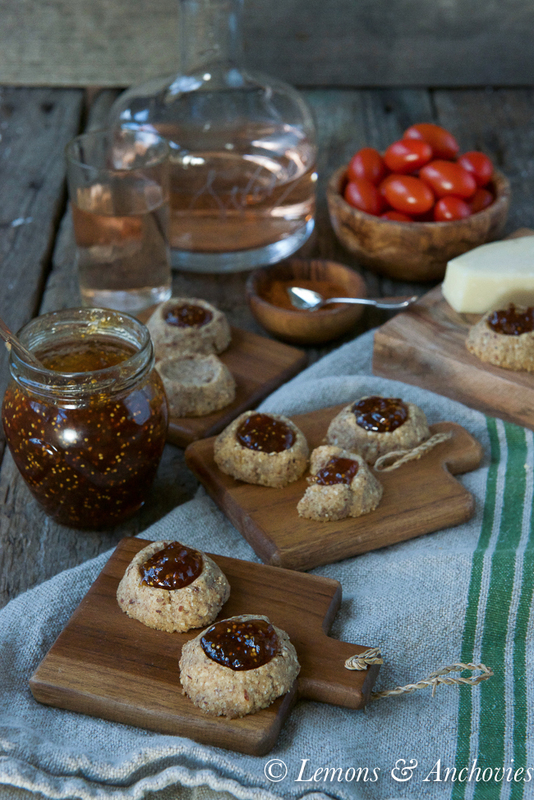 Love that you also used pistachios and of course, that chocolate! Yay!! Congrats on the Top 9!!! Gorgeous photos as always. The two of you provide endless inspiration to me. Someday I hope to be able to make a scene like you do. Love the pistachios here. Nicely done! Kim, thanks! I didn’t know I made Top 9 until I read your comment. It’s been a while! The friendships formed through our food blogging community is truly the greatest gift. I love visiting both your blogs and am always inspired by your words and images. Chocolate and pistachio is a delicious pairing and the scene you’ve created is so inviting. Happy holidays, Jean! Thanks, Priscilla! I’m very happy to have made friends in this food blogging community–you included of course! 🙂 Happy Holidays to you, too! These look fabulous and would be a great gift. Thanks for the idea. 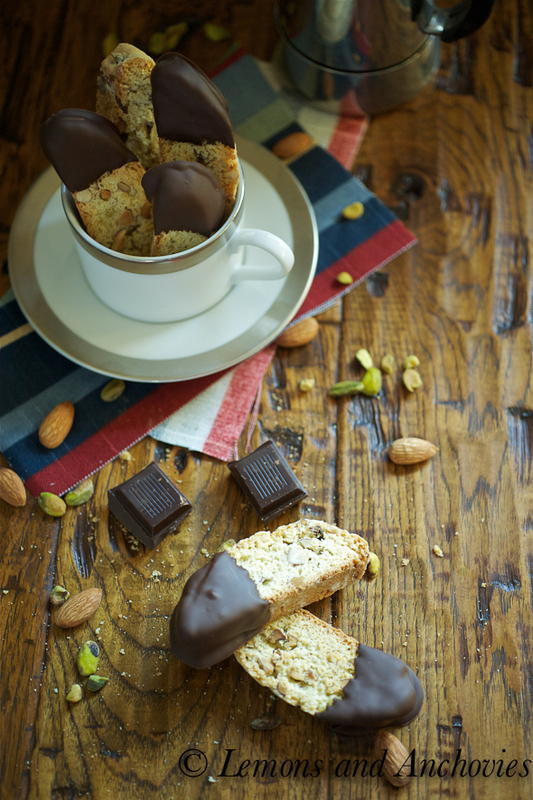 These biscotti look wondeful! Nuts and chocolate together is a great combination.